The Añejo in Añejo Tequila Honey Sour in Spanish translates as 'matured' or 'aged'. This is a phenomenal modern adaptation of the traditional Margarita. If you like Sours (a base liquor and a sweetner) you will simply fall head over heels in love with this Cocktail. No one actually knows who invented the Mexican Margarita, though there are many clims to fame. It is believed to have been first created in the late 1930's. 1. Place all ingredients into a Cocktail shaker or Boston Can. 3. Add ice cubes and shake again. 4. Place ice cubes in an Old fashioned (or Rocks) Cocktail Glass, strain shaker contents into glass. 5. Garnish the Añejo Tequila Honey Sour glass with a thin slice of orange. A Sour Cocktail is the name for a set of mixed drinks that contain firstly a base liquor (in this case - Tequila) plus the sour element such as lemon or lime. A sweetener is then added. This could be for example, simple syrup, grenadine, triple sec or even pineapple juice. 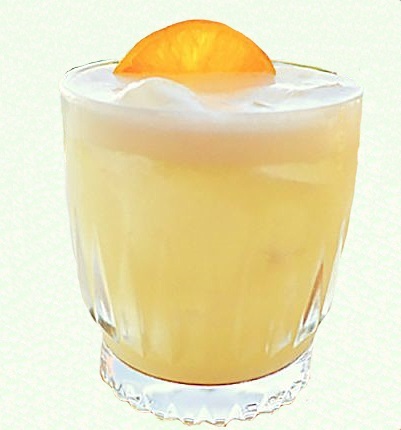 In Añejo Tequila Honey Sour the sour element is lemon juice with the sweetener being Honey syrup. The Añejo Tequila gives a greater or more pronounced flavour and taste of oak, various spices, sweet caramel and butterscotch. Each Tequila is different and will thus given a different result or taste. There is no right or wrong Tequila to use - however Mixologists do recommend an Añejo Tequila for certain Cocktails. In 2005, a brand new category was created - Extra Añejo (aged) by the Consejo Regulador del Tequila the 'governing body' for Tequila in Mexico. The more aged the Tequila (over three years), naturally the more expensive it will be - and of course the heightened pleasure and taste sensation it will give. Añejo and Extra Añejo can be expensive. For true Tequila followers and lovers, the flavour and its age will dictate which Cocktail or drink it is to be used in. Like single Malt Whiskey, there are massive subtleties and differences. For Añejo Tequila Honey Sour, the aged Tequila works phenomenally. You will be impressed!